Security guards at D.A.R.P.A. break into the room Baxter has sealed off and find their dead companions along with the body of Baxter Stockman, which has had its brain removed. 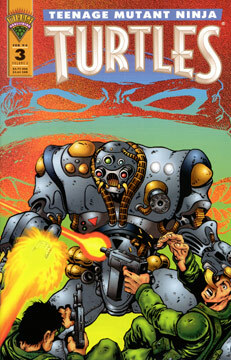 The soldiers then discover a strange robot – which quickly kills them. The mechanical monster approaches the dead form of Baxter Stockman and takes his glasses before departing. Raphael moves into the steeple of an old abandoned church. Donatello is cooking at Casey’s farm when a police officer pulls into the driveway. The cop enters the house, but Don has fled. The officer assumes that some squatters have moved into the abode and radios into dispatch, where he’s told, much to his surprise, that the place is owned by Arnold “Casey” Jones. Leonardo is showing Michaelangelo a spot in the sewer that he feels would make a good lair. Mike reveals that he plans to stay in April’s apartemnt building, as he wants to be close to Shadow. Leonardo is determined to move back to the sewers. The brothers mull over how much things have changed. The robot has left the D.A.R.P.A. headquarters and is roaming the desert.